We have all read stories in books, magazines and blogs that go something like this….. we were on the first hole of (insert name of a golf course) and the starter asked us if we would mind if another couple of guys could join us. Sometimes it turns out that you get to play with some pretty good golfers or other times, real duffers, but most times its an enjoyable experience and you have a great day of golf. Then there are those rare occasions where it turns out you get to play with famous people. I had one of those experiences last week. I was staying with my friend Ken Ross at his winter home in Phoenix and we were booked to play Granite Falls North in Surprise Arizona. It was just the two of us. As we were about to tee off the starter walked over and said he just got a message from the Pro Shop. A couple of guys had turned up without a tee time and would we mind if they joined us? Naturally we said that would be great. He sent the two fellows over and because we were a little past our tee time by now, there was little time for in depth introductions. We all hit our tee shots and the two new members of our group both duck hooked their drives well left and we were off. As we proceeded down the first fairway I was thinking to myself, that one guy looks very familiar. Because our introductions had been hurried I said to Ken, “you know, that one guy looks really familiar, what did he say his name was?” Neither of us knew for certain. We played on and then on the third hole it clicked: I knew where I had seen the face before. It was in the World Series. I also remembered hearing on the news that the Kansas City Royals were in Arizona for spring training. After we putted out I casually said, “do you play any other sport like maybe baseball’? A big grin crossed his face and he replied, “Yes, I’m Kelvin Herrera, the closer for the Kansas City Royals”. It became obvious as the round progressed that Kelvin was relatively new to the game of golf and that he did not have the same control with the driver that he demonstrates when throwing a 100 mile an hour fast ball. It was equally obvious that although unpolished at golf he possessed tremendous power. He demonstrated it on the tenth hole when he hit a drive along the left edge of the fairway perhaps half a nine iron past my drive. He was very pleased and wondered out loud how far the ball had gone. There was a very large cactus next to the tee box about 10 yards ahead of the spot where we teed off so I said we would go out to his ball and use the range finder to ‘shoot’ the cactus and then add the ten yards. He hit that ball 320 yards. All in all we had a great day! It was rewarding for both Ken and I to shoot a lower score than a young finely tuned professional athlete, realizing of course that if he ever fine tunes his golf game we would be toast. Ken and I agreed that this summer when we watch the Blue Jays play the Kansas City Royals and it gets to the 9th inning we will be watching a little more closely than usual and thinking back to that day in February 2017 on a golf course in Surprise Arizona. Harry almost bought a …..’swoosh’. Golfers are very susceptible to advertising and the companies that manufacture golf equipment and golf related gadgets have learned to play golfers like a fiddle. The biggest selling features for new equipment and gadgets are expressed in these three words: higher, longer, straighter. Let’s look at ‘Harry’, a typical amateur golfer. Harry is a few years south of middle age and has reached the stage in his golf career where he realizes he will not be a professional golfer (scoring in the low nineties just won’t cut it on the tour). No matter, Harry still wants to hit it higher, longer and straighter. He has tried taking lessons and has purchased some on-line instruction packages that virtually guarantee to make him a better golfer. Alas, Harry is still shooting 93. Now understand Harry hits it pretty long. Once when he was 35 he hit a drive 265 yards, with a nice little 5 yard draw that ended up in the middle of the fairway and rolled out nicely. So in his mind Harry knows he can hit the ball 270 yards if he catches it just right and the wind is not blowing. It must be the equipment he is using. Like all of us Harry watches the Golf Channel and has seen all the infomercials. Tees that will make the ball go 3 yards farther. A practice harness that will eliminate his slice and with the slice gone give him an extra 15 yards. Shoes that will impart latent energy to his feet, that’s good for another extra 5 yards. Then of course there are those balls, the shiny lime green ones that according to the testimonials on the infomercial ‘added at least 20 yards to my drive’. Then there are wedges that will do everything – you know, the ones that guarantee you will never leave another shot in the bunker and that make chipping from off the green a breeze and that after hitting them just once feel as though they had been in your bag forever. And of course those irons and the driver that make the ball go an additional 30 yards. And lastly of course that gadget, the ‘swoosh’ or whatever it was called. Just swing that thing 10 times prior to playing and your drives were sure to go an extra 30 yards. Harry calculated and kept a cumulative total in his mind. He had already driven the ball damn near 270 yards once back in 1999, add the tees (273), the anti slice harness (288), the shoes, (293) the new balls (313) and of course the new driver (343). Because Harry plays on a course where many of the par fours are just over 340 yards he decided to pass on the ‘swoosh’. With the addition of the ‘swoosh’ he would just end up hitting too far over the green on the par 4’s. Having spent just over a thousand dollars Harry went out and shot….you guessed it, 93. For me the 2016 golf season is over. I don’t like playing when the temperature gets below 10 degrees celsius so its time to pack away the clubs and recap what happened in 2016. 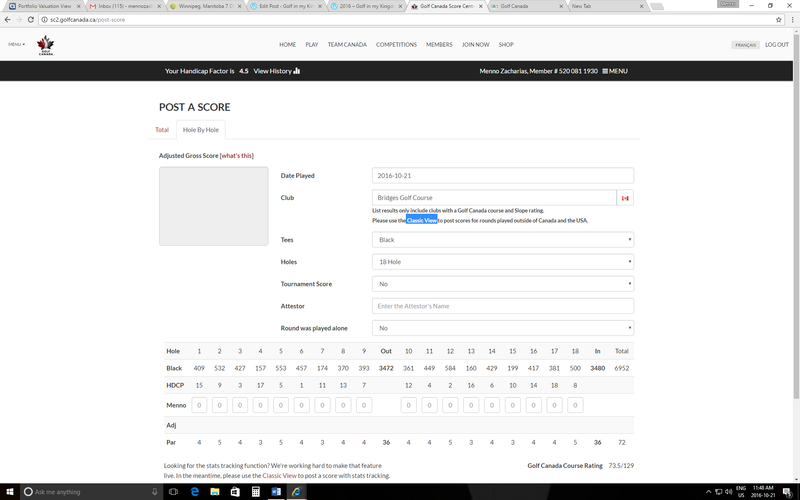 As indicated in an earlier post I entered my scores into the Golf Canada Handicap System using the hole by hole format, and I added a few basic stats, those being, number of putts and fairways hit. Based on that the system generated considerable data. The first screen shot shows the results for “all courses” while the second and third screen give the results for Bridges and Wildewood the two courses where I play the majority of my games this year. In subsequent posts I will attempt to interpret the data and determine if and how it can be used to direct practice, approaches on the course and hopefully overall game improvement. 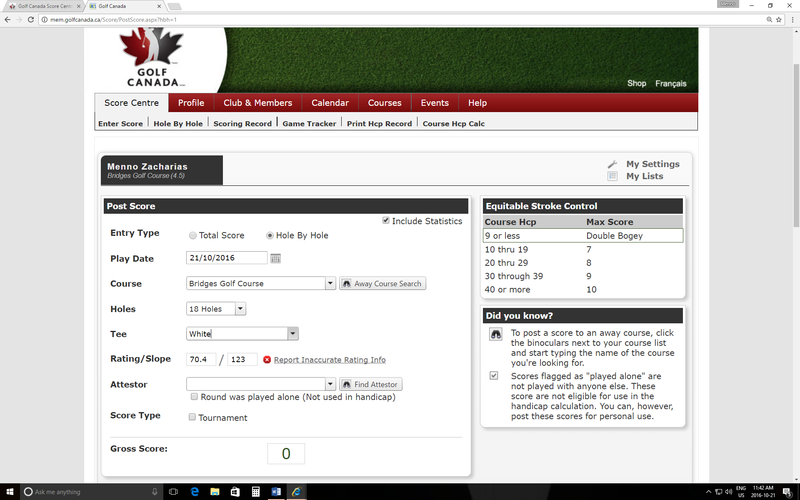 Before I present the statistics captured on the Golf Canada site for the rounds of golf I played in 2016 season I will provide a very brief explanation as to how to go about entered your scores and related information to be able to capture this information for your game. When this page comes up click on the “classic view” which I have highlighted in blue. When you click on the classic view link the following page will come up. When it does, click on the ” hole by hole ” and “include statistics” boxes. 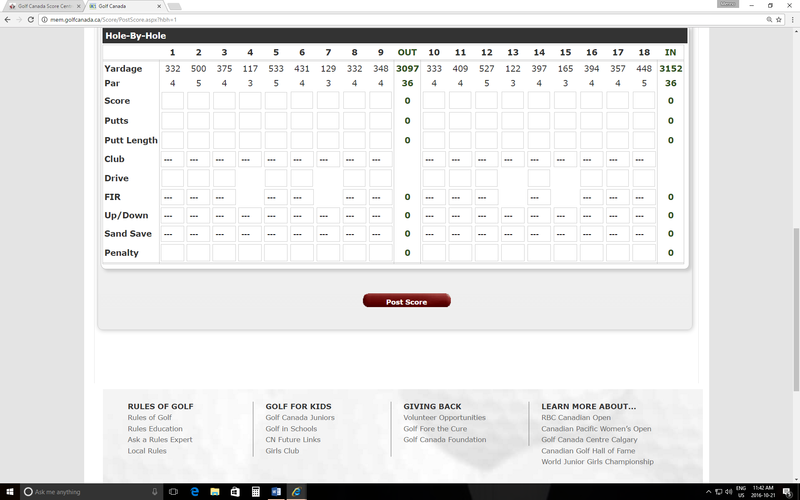 This is the bottom portion of the score entry page that comes up which allows you to enter not only your hole by hole scores but also a variety of other information. For 2016 I entered the hole by hole score, numbers of putts, and fairways hit in regulation. In the next post I will outline the type of data that is generated when this very basic information is entered into the system. It’s unfortunate but here in southern Manitoba our golf season is nearing the end. I’m thinking perhaps another ten games or so before the courses close. There is however one thing I’m looking forward to. 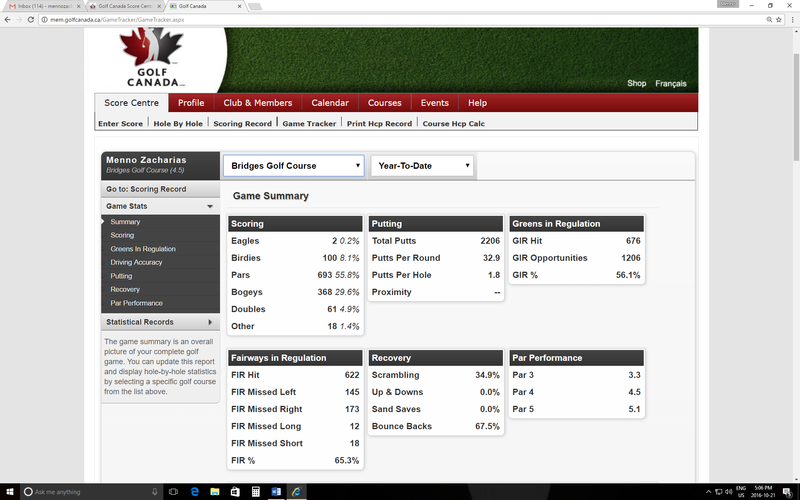 As mentioned in a previous post it was my intention to record some basic stats relative to my game using the Golf Canada Game Tracker. This past season I entered every game I played using the hole by hole input screen and enhanced the data input slightly by using the ‘stats’ feature. 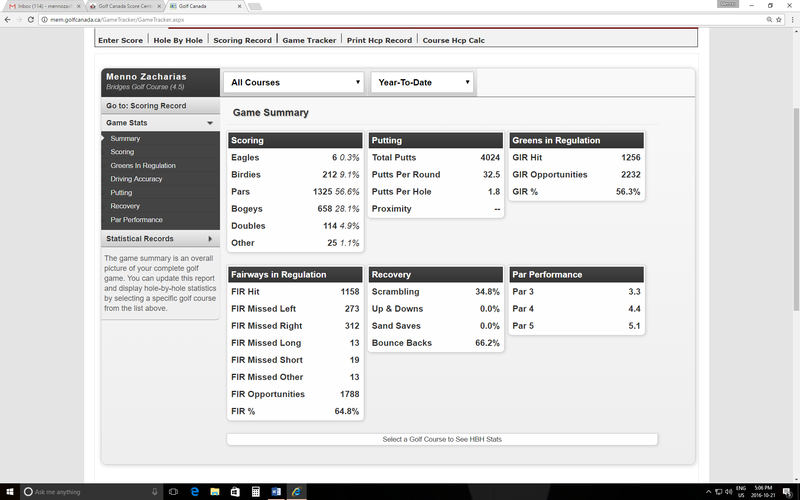 I did not record all the statistical categories available, just some of the basics like putts and fairways hit. Entering such basic information provides you with a wealth of data as calculated by the statistical program. It provides your average putts per round, putts per hole, average putts on a given hole, average score on a given hole, fairways in regulation, greens in regulation, scrambling and bounce backs. Once the season is officially over I intend to review the data and write one or more posts that provide a breakdown of how the year went, and hopefully how the data generated can be used to identify potential areas for improvement. At this time of the year, when all the competitions are concluded golfers at times need an incentive to spice up their games or just to keep their interest up. In my case I’m now north of 110 games played for the season and unless there is something on the line my interest tends to wane and at times I suffer from lapses of concentration on the course. Playing for something (money) no matter how small the amount can get everyone back in the game. On the first tee this morning I made my three golf partners and offer the could not refuse. I proposed that we play my ball against their best ball. My handicap is 4 and they are all in the 10-12 range, and pretty solid players. Needless to say they accepted the proposal. Things did not start out well for me. I bogied the first hole and lost the next two to birdies. By the time we got to the 9th hole I was four down, so naturally I used my front nine press and was fortunate to win the 9th hole with a par to cut my front nine losses. I played better on the back nine and managed several clutch putts to par holes for ties on the back nine. The long and the short of it was that when we reached 18, I was two up on the back. Now it was their opportunity to press and they did. We tied 18 with pars so the press was a tie. It ended up they won the front and the 18, I won the front nine press and the back nine so no money changed hands. However, all of us were invested in the game and the outcome for all 18 holes and if was an enjoyable and challenging match. I’m hoping we do this again. I fully understand my odds of winning are not great but it was an enjoyable challenge. A couple of days ago a message popped up in my promotions tab with a great offer from Quarry Oaks. The offer was the twilight rate ($42.50) with cart but starting at 1230 in the afternoon. I sent out a message to some fellow golfers and was quickly able to get a foursome together. We played yesterday (2016-08-24) with a tee off of 12:38. 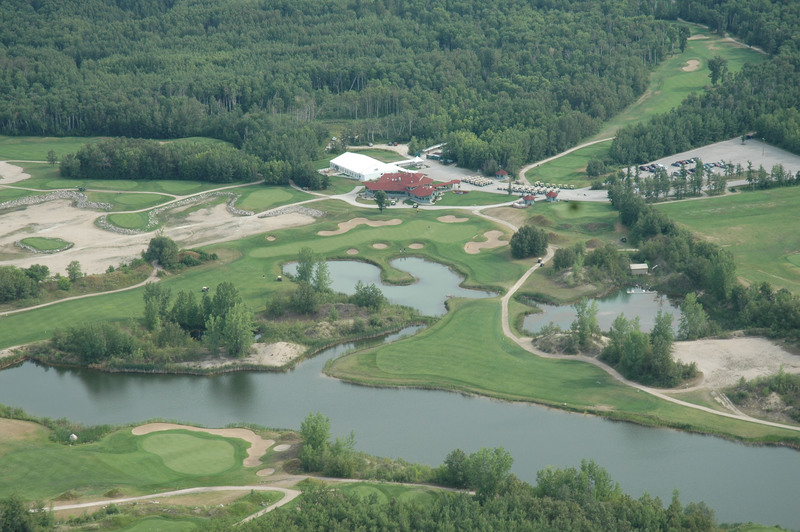 I’ve played Quarry Oaks many times over the years and every time I do I lament that fact that it’s located east of Steinbach, and I live in Winnipeg. It’s the type of course that were it closer to a major population center would attract a high volume of golfers. It is the type of course (if it were closer to where I live) I would be a member of. Variety. Three very distinctive 9’s that offer significantly different views and challenges. Well conditioned tee boxes, fairways and greens. Interesting carries over waste areas and water. Undulating greens that are challenging yet fair (if you put the ball in the right spots). Friendly staff and superb service. There are many more reasons but you probably get the drift. I’ve often said to golfing friends from Ontario: if Quarry Oaks were located in Ontario people from Toronto would gladly drive 1 or two hours and pay well over $100.00 to play a round of golf on a course that provided the experience Quarry Oaks offers. If you have never played the course, or have not played it recently you need to get out there. It’s the type of layout you need to play several times a year even if you don’t live in the immediate area. It’s that good!